Our Southwestern Colorful Kitchen was featured in Houzz. 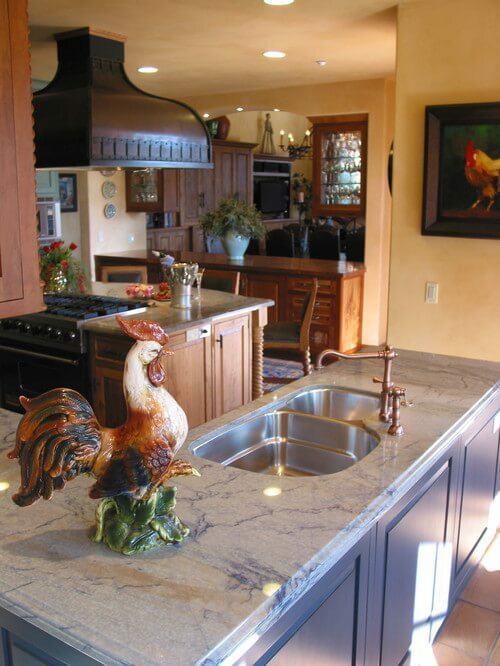 Our client wanted a Southwest inspired kitchen space that combined modern design elements with rustic style. We took this opportunity to play with colors! Each section of the kitchen was done in a different color whether is was stained, painted or pigmented. The color palette we chose was traditional and very indicative of the southwest; deep brown and clay hues with pops of reds and blues, but we mixed them with non-traditional combinations. We painted and hand stained the wooden cabinets and multiple counter top surfaces to create a warm, welcoming, and casual feel. To make the space more connected we joined the kitchen and dining room together using a built in buffet that was accessible from both rooms. Our client found a beautiful shell exterior for the hood at an antique dealer which we installed above the kitchen island cook top. When viewed from the living room this artistic piece became the focal point of the kitchen. We surrounded the island with ample counter top space with room for the built in refrigerator and oven and the service sink which provided nearby cleanup space. We had a challenge in the kitchen design space since the client wanted a pot filler over the range which was a cook top in a kitchen island. For the solution we chose a commercial, pull down faucet and mounted it in the Abbaka hood liner. To make the design seamless we created the option for the pot filler to be hidden when not in use. In addition to the functionality and traditional coloring we also did a great deal of tile work. The backsplash tile was chosen to complement the colors in the kitchen. They featured a variety of colors within our palette in patterns that represent the south west style. We also inlaid ceramic tile flush into the surrounding flooring which at first glance may look like a carpet. All of the colors of the kitchen; counter tops, cabinet colors, wall colors, accessories all originated from this tile design. For more design inspirations or advice on remodeling or redesigning your contact the experts at Domicile.